Be inspired by our password-protected, info-packed online article archives. Explore this trusted, first-hand travel insight from the world wanderings of Hideaways staff and members. Our wealth of insight is available only to members, so you'll have the travel edge when it comes to knowing where to find the best lodgings, what to see during your stay, and where to have the best dining experiences. Our articles are candid and entertaining--sure to pique your travel wanderlust! Below, you can start your search of Hideaways' travel and destination articles. In your results, you'll see articles from our current member publication, Hideaways Life®, as well as our previous online TopX and From the Field e-newsletters. 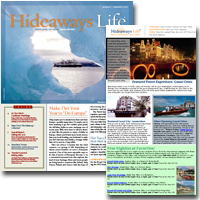 Articles also are available from our older publications, Hideaways Guide and Hideaways newsletter.